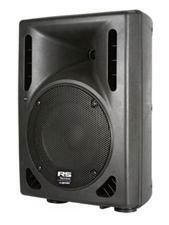 The 12" Gemini RS-412 2-way active speaker system offers 200W (245W + 55W) RMS power and 800W peak. The trapezoidal ABS impact-resistant nylon fiber cabinet houses a 12" woofer with 2" voice coil and a 1.35" coil pure titanium compression driver. A wide-design molded horn provides superior sound dispersion. It also has a mixer section with XLR and 1/4" mic inputs with separate gain controls, line RCA and XLR inputs, and a 1/4" output connector. It's also equipped with a master volume output control, bass and treble tone control, and a power-guided clip alert LED. Recessed, smooth-molded handles make the RS-412 loudspeaker easy to transport, and it is flyable and stand mountable to adapt to your venue.